The appropriate mobile technology stack is more important than many entrepreneurs may think. It's not only the matter of scalability and stability, but capacity to solve complex business challenges as well. That's why the creation of an effective solution requires consideration of both business peculiarities and technology aspects. Many of our customers participate in meetings with our team. They tell us about their expectations towards an app and we explain how we can achieve them. As a rule, this doesn't take much time, but helps a lot in selecting the most suitable and cost-efficient mobile app stack corresponding to both business needs and set tech goal. Through this article, we would like to show businesses how to pick the most technology stack for mobile applications. This is the most popular solution among both business owners who want to scale and startuppers who need to roll out a great product. And there are strong reasons for that. Native apps are productive and highly reliable in terms of security. Furthermore, they can access various smartphone features that other app types cannot (e.g. NFC module, camera, address book). So, let's consider a mobile technology stack for the most popular platforms. It has been the main language for iOS app development for many years before Swift appeared. Even though Apple is now focused on Swift, the support of Objective-C won't stop anytime soon. This language is still widely applied to projects of different complexity. Actually, it fits pretty well for them as it's able to solve difficult software engineering problems with ease and grace. Despite all this, we think that the main reasons for using Objective-C instead of Swift are either an existing large project written on this language and requiring constant updates neither absence of experienced Swift developers. In other cases, this language isn't the best choice for your mobile technology stack as it is inferior to Swift in many things. This is a relatively young programming language that saw the light in 2014 and one year later was made open-source. It's often treated as the future of programming and that makes sense. Swift demonstrates surprising results in performance compared to other popular languages. Nowadays, an overwhelming majority of our iOS projects are built with Swift. Why is it good as a part of application technology stack? First, the Swift's syntax contributes to making code safer as it's designed to be stable and avoid mistakes previously possible in Objective-C. That results in fewer problems and crashes. Second, Swift lets developers make fewer mistakes in code and requires less of it compared to Objective-C. Respectively, development goes faster for developers and more cost-effective for customers. To create an application, developers use a dedicated software that's called an Integrated Development Environment (IDE). This is the only IDE created and officially supported by Apple. Put simply, Xcode is a user interface development tool allowing to build native apps and games as well as publish them to Apple's App Store. It supports all Apple platforms from watchOS to tvOS and everything in between. Also, it's equipped with a variety of tools and supports a variety of languages except for official ones including Java, C, C++. It's an alternative to Xcode from a third-party developer. AppCode also supports a variety of languages. The choice of IDE is a matter of taste but some developers claim AppCode enables faster coding compared to Xcode. However, it has no alternative to Xcode's Interface Builder feature that allows designing interfaces without writing any code. Java is one of the world's most popular languages. It's suitable not only for Android development but the web, Big Data, and more. Being a widely used language, Java offers a myriad of open source libraries and tools. What's more, major players like Google, Yahoo, and Facebook constantly contributes to these toolings to make them better. Respectively, it positively affects both the speed of development and product quality. However, this reputable language has drawbacks as well. Comparative slowness and high memory consumption are one of them. Java is a good fit for the mobile technology stack of complex projects with a focus on scalability. Also, it's unreasonable to use Kotlin for your app in case your team consists of highly skilled Java developers with little knowledge of Kotlin. This language was originated back to 2011 and now it's supported by JetBrains company and third-party contributors. In 2017, Google announced the support of Kotlin as the second official Android development language. This language is a good fit for both new and existing projects. That's because it's fully interoperable with Java that means developers can continue developing an existing Java-based project using Kotlin. Another prominent advantage of Kotlin is that it has a clean and powerful syntax which usually results in 25-35% less code compared to Java. Respectively, developers are able to deliver a more stable code with fewer bugs. Currently, we use Kotlin for all our Android projects. 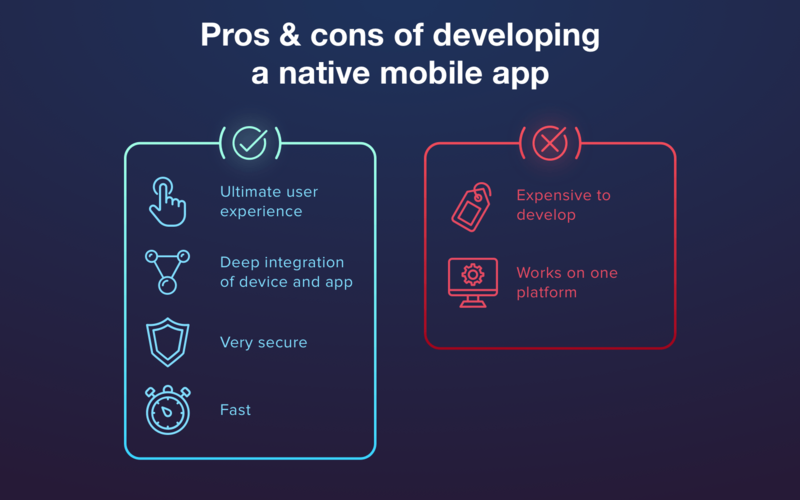 Compared to iOS, the toolset for Android for developing native apps has more IDE options to choose from. However, we'll consider the most popular ones. Android Studio is IDE from Google that's based on the well-known solution from JetBrains company. It gives developers everything they need for creation of native Android-based applications. On contrary to Xcode, that's available on Mac OS only, Android Studio is present on each popular operating system for PCs. In fact, a hybrid app represents a website wrapped in native containers. That's how they can access some native features of a platform or hardware (e.g. camera), while an ordinary web app cannot do so. Put simply, hybrid apps look alike to native and can be distributed via app stores, but they are based on websites. 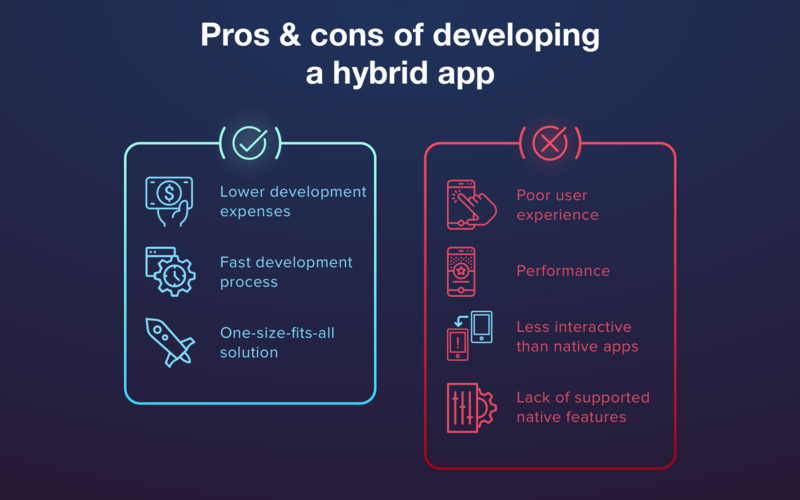 In turn, technology stack for hybrid apps differs from anything we've discussed above as developers should use various frameworks and plugins to make them work. Let's consider the most up-to-date frameworks for the hybrid app technology stack. However, to build apps with this framework, you should have an IDE that is supported by a platform (e.g. Android Studio or Xcode). As for Ionic and Sencha Touch, many popular IDEs support these technologies natively or with the help of a plugin (e.g. solutions from JetBrains, Visual Studio, Eclipse, and so on). Hybrid apps can be referred to cross-platform as well. The difference is they are rather websites imitating native apps. 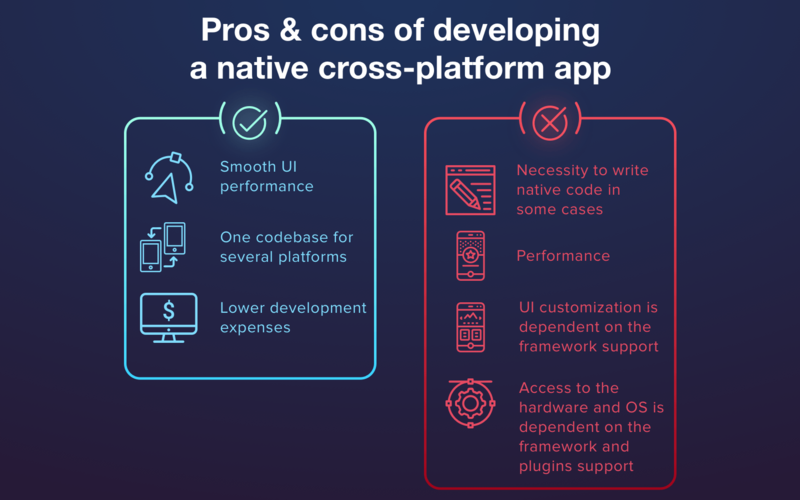 In a perfect world, native cross-platform apps use one code base to work on several operating systems. Let's consider what technologies you should use in your mobile app stack to build a cross-platform app. It's often selected as a part of mobile technology stack for native cross-platform apps. It makes possible to write code in C# programming language or .NET framework. As soon as the code is written, it's compiled into the native UI of Android, iOS or Windows. The technology lets developers build and test apps, as well as monitor them in the cloud. In addition to this, Xamarin supports a cross-platform UI toolkit. The framework provides different tools for debugging and packaging that help to save time. In addition, developers can check how their code works on a screen of the device in real time. These technologies are supported by the same IDEs as in the case with hybrid apps. The choice of the appropriate technology stack is an important part of software development. It will influence the stability of your app and usability for customers. If you need any help with building your project, you can drop us a line. Our tech-savvy managers will consult you and help to decide on the most suitable mobile technology stack. Don't forget to subscribe to our newsletter if you like this article! No spam, just one letter a week with the latest videos and articles from our team.